Sterling Children's Books, 9781454923817, 32pp. When Grandma gives you a lemon tree, definitely don't make a face Care for the tree, and you might be surprised at how new things, and new ideas, bloom. "When life gives you lemons, make lemonade." 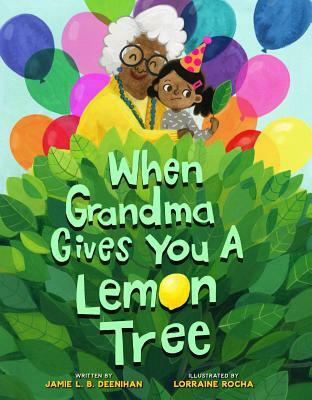 In this imaginative take on that popular saying, a child is surprised (and disappointed) to receive a lemon tree from Grandma for her birthday. After all, she DID ask for a new gadget But when she follows the narrator's careful--and funny--instructions, she discovers that the tree might be exactly what she wanted after all. This clever story, complete with a recipe for lemonade, celebrates the pleasures of patience, hard work, nature, community . . . and putting down the electronic devices just for a while. Jamie L. B. Deenihan is a teacher and picture book author who lives with her husband and two children in Suffield, Connecticut. When Grandma Gives You a Lemon Tree is her first picture book. Visit her online at jamiedeenihan.com. Lorraine Rocha studied illustration and animation and worked at Lucasfilm's VFX and animation studio Industrial Light & Magic, contributing to such films as Indiana Jones and the Kingdom of the Crystal Skull and Ironman. She is the illustrator of Zebra on the Go by Jill Nogales (Peachtree). Lorraine lives with her husband and daughter in San Leandro, CA.